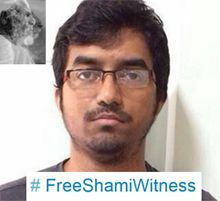 #Shami Witness, aka Mehdi Masroor Biswas, was denied bail today by a Special Terrorism Court in Bangladore. The court also granted police another 6 months to file charges. The request was made a month ago. Pro-ISIS Tweeter and news disseminator Mehdi Masroor Biswas, aka @Shami Witness, arrested in India in December, 2014, is still in custody in India. No charges have been filed. He hasn't had a bail hearing yet. The latest 90 day extension of time to file a charge sheet expires this week. On March 9, Bangladore police requested an additional six months to file a charge sheet. 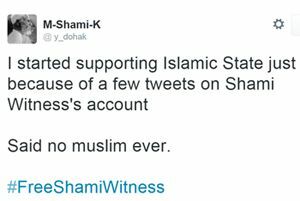 Shami Witness, the tweeter from India who posted ISIS news updates with favorable comments, went to court yesterday. His police detention is over, and he has been remanded to judicial custody until Jan. 15. Bengaluru City Police Commissioner M.N. Reddi told reporters: "During interrogation, we figured that he (Biswas) was in direct touch with ISIS fighters. We have gathered evidence to show that he supported IS. Apart from proactively tweeting for the group, his messages prove that he encouraged youths to join the organisation." The police also said that their investigation into his role in working as a propagandist was complete. "He cooperated during interrogation and never refused to share any information that we sought. We will seek his custody if required in the coming days based on inputs from the National Investigation Agency," a police source said. Police in India have obtained a 15 day extension of time to hold Shami Witness (Mehdi Masroor Biswas) as they continue their investigation of him and his Twitter account. They had asked for an additional 25 days. Shami has been allowed to meet with his parents. Biswas was arrested under Sec 125 of IPC (waging war against the Government of any Asiatic power in alliance or at peace with the Government of India or attempts to wage such war or abetting waging of such war), Sec 18 and 39 of Unlawful Activities (Prevention) Act and Sec 66 of the Information Technology Act. India has now moved to have ISIS added to its list of designated terror organizations under the Unlawful Activities (Prevention) Act. However, the list already included any organizations that were designated terror organizations by the U.N. and ISIS has been designated by the U.N.
India Home Minister Rajnath Singh gave a statement to Parliament about the arrest of Shami Witness yesterday. "The interrogation of Mehdi Biswas has indicated that his activities were limited to posting and reposting of pro-ISIS (as the IS was previously known) material on his Twitter account and social media sites," the minister said. ...He used to visit prominent IS-related sites, mostly those in the Arabic language, and then used Web-based tools to translate the contents into English and repost the material on his Twitter account, Rajnath told Parliament. He didn't call Shami a terrorist or jihadist, instead describing him as someone who "interacted with people on social networking sites 'on matters related to jihad'." He portrayed him as more "swagger than substance." "Shami Witness", the prolific tweeter about ISIS who was outed Friday by a British news channel, has been arrested in India. He's being investigated for a violation of the Information Technology Act. Mehdi Masroor Biswas, the person behind Twitter handle "@shamiwitness", is a 24-year-old engineer who worked for a multinational in Bengaluru, police said. He moved to the city in 2011 and stays in Bengaluru's upscale southeast suburb. Police said he is an alumnus of West Bengal Institute of Technology. Sources say Mehdi did not have any direct link with Al Qaida or Islamic State group and nothing as yet suggests he was in direct touch with any jihadi element....So far, no anti-India activity or tweets posted by Mehdi have been found. Nothing has been found to infer Mehdi suggested any attacks in India, say sources.